Leaders of the Rail Maritime and Transport Union have welcomed the news that Network Rail will hold talks with them in their dispute over pensions. Members voted in favour of strikes last week and Network Rail has said fresh talks will take place, with a date likely to be fixed for later this week. The RMT is yet to announce dates for possible industrial action. Meanwhile, Network Rail said detailed ballot figures showed a narrow majority of signallers favoured a strike. The turnout for last week's vote among signal workers was 75%, National Rail said, with just 50.8% in favour of action. Network Rail added that 69% of maintenance workers had been in favour, with a turnout of 53%. 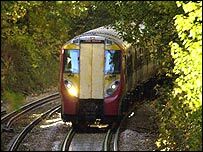 A strike by signallers would have a huge impact on the network but action solely by maintenance workers would have little effect. Speaking about the new round of talks, National Rail chief executive John Armitt said: "We will now look to meet with the RMT as soon as they are able, to continue discussions that will enable us to avoid a strike." He had earlier said that demands by the RMT union for more pay, travel concessions and pensions would cost the company an extra £40 million. The extra money was more than the cost of an original 3% pay offer, said Mr Armitt, who added: "There is not a lot of money available." Management's move to begin talks was welcomed by the union. RMT general secretary Bob Crow said: "We balloted our members in response to Network Rail's failure to negotiate and we welcome the company's indication that they are now prepared to talk about the issues at the heart of this dispute. "We have said from the start that we are ready for serious negotiations at any time. "I wrote to Network Rail last week seeking talks and I now look forward to receiving a positive response." The union is also protesting at the closure of the company's final salary pension scheme for new workers because of rising costs. Mr Armitt said the scheme which has replaced it is very good and would provide a good pension for workers.